Balloon sponsorship can take many forms but in simple terms it is when somebody makes a major contribution to the capital expenditure of the equipment and running expenses. In return the sponsor normally would have some advertising of their company or organisation visible on some part of the balloon. They also sometimes would be able to call on the balloon to make various flights for their benefit. What are the benefits for the sponsor? Ballooning costs can be significantly reduced for the individual by gaining sponsorship for your balloon. This sounds wonderful for you the pilot or syndicate member, but what benefits does it offer to the company who is paying the money for sponsorship? The simple answer is advertising and promotion. This advertising and promotion can be one of the strongest and cost effective types available. Why does balloon sponsorship work so well? Balloons draw attention. People the world over like Hot Air Balloons. Wherever a balloon is in the sky or on the ground it will always draw a crowd of people. Even the inflation of a balloon for a private flight will draw a small crowd. If you are at a large ballooning event then tens of thousands of people will see your balloon. If there is media coverage, which is often the case at many events then the numbers seeing your balloon increases beyond belief. Now imagine your balloon as the worlds biggest bill board or advertising poster. This is what a balloon can be and everyone will remember it. Statistics have proved that the recall rate for balloon advertising is much greater than any other form of advertising. People always look up when they see a balloon in the sky. Because of its huge size, it is very difficult to miss and because it is in the sky they are surprised yet excited to see it. It draws their immediate attention time and time again. No matter how many balloons people have seen they never seem to loose their fascination. On many occasions people will follow a balloon for long distances just to get a closer look. How many people do you know who will look at an advertising billboard for more than a few seconds or will tape record a TV advert? Many will people will take photographs and videos. Whether it is the shear size and colours, its grace of movement or the spirit of adventure, balloons attract attention and people want to record that in photographs to look at time and time again. Look in any greetings card shop and you will see at least one card with a photograph of a balloon on it. Look in holiday company literature and brochures promoting tourist venues. You will see a photograph of a balloon. People like balloon photographs. Television companies like the colour and the attraction that balloons have. They love to cover ballooning events where there is the strong combination of balloons and crowds of people. Imagine the impact a company logo can make using a balloon as an advertising medium. Compared to other forms of advertising, balloon advertising can work out much more effective with much lower cost per thousand people reached. Television advertising is expensive so 20 seconds exposure of you balloon on television alone can be very often equivalent to the major cost of the equipment. Newspaper and magazine editors have a similar interest in balloons and balloon events. These events are regularly reported and recorded with photographs. A scrapbook can be kept of the reports and photographs just to show how often the balloon with the logo is shown. Again this type of advertising would cost a significant amount of money to achieve if one were to purchase the newspaper advertising space. However Balloon advertising should not be seen as a replacement for other form of advertising. What it does do is raise awareness of the company, brand or organisation. It has been proved time and time again that other forms of advertising benefit greatly when a balloon sponsorship is also used. It should also be noted that balloons would not be normally used for special weekly product promotions. Balloon images are remembered for a long time. This is the tremendous advantage of using this media. What other benefits are there to the sponsor? They and their family, friends or customers can fly. Very often as part of an agreed sponsorship package the pilot agrees to a certain number of flights for the sponsor. The sponsors can choose to use these flights for corporate entertainment, which can benefit their company or they may just prefer to have friends and family flown. Corporate entertainment exists in many forms and a balloon flight is recognised as a very high value item in this specialist field of marketing which can benefit the company in many ways. How can I get sponsorship? • First identify a number of companies or organisations that you feel can benefit from sponsoring a balloon. • Prepare a proposal, which explains why they need a balloon for promotion and advertising. Explain all the benefits to them, which we can now see are many. • Decide what you are going to do for them with the balloon. For example, you may just fly it for your own benefit but in an area which they need constant exposure. Alternatively you may agree to cover a number of national or international balloon fiestas as well. You may also agree to tether it at company promotional events. • Decide what level of sponsorship you want. The greater the sponsorship the more likely that you may have to give up some of your freedom of use of the balloon as well as some of your free time. 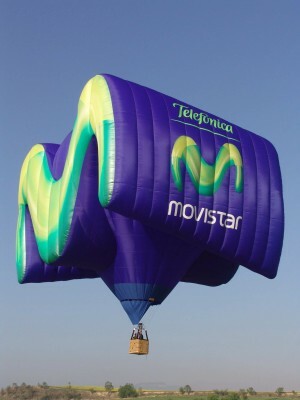 • Determine the cost of equipment required including approximate advertising costs on the balloon by contacting your Ultramagic dealer or Ultramagic customer service. This will be handled in strictest confidence for yours and your potential sponsors benefit. • Determine additional costs that you would like to be covered by the sponsor. For example, insurance, trailer, chase vehicle. • Present all of the facts to the potential sponsors in a clear honest way. Emphasis the benefits to both sides. Be enthusiastic but do not promise something that you cannot honour. By taking the above steps many people have created a long lasting arrangement where companies gained tremendous advantage from sponsoring a balloon and balloonists were able to enjoy the sport that they love so much. If you think that sponsorship may work for you then give it a try.